as I see it: Is this Treat Tasty? To start with, let me declare that this is not a April Fool's Day Joke. This is something I saw today and found weird. So how many of us have heard of the brand Tasty Treat? 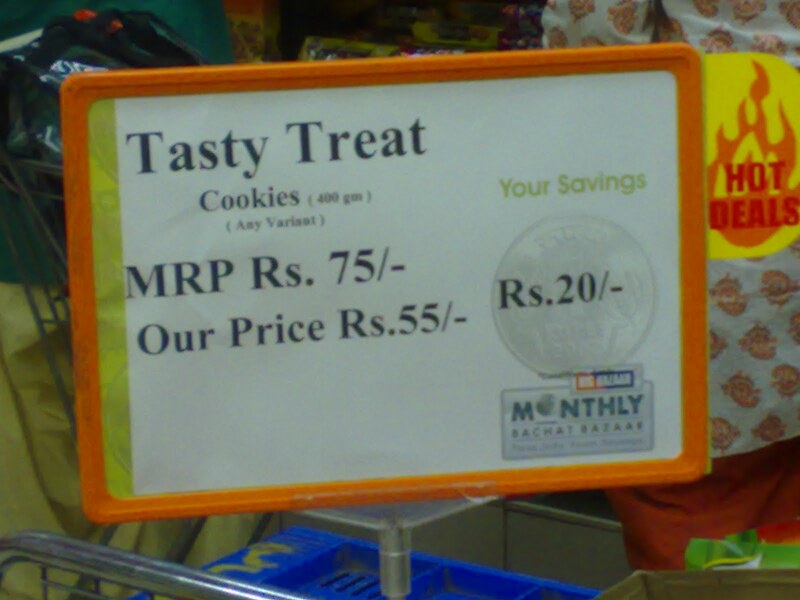 And how many of us know that it is actually a brand introduced by Food Bazaar itself? Its their own brand. Why do they have to show it like this? MRP was set by them and "Our Price" is again them. Where from the savings of Rs. 20? I am not really aware if the Tasty Treat brand products are available outside Food Bazaar but even if they are, this display is weird. 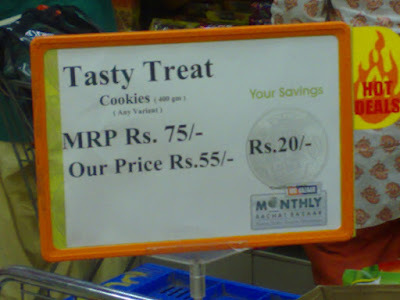 Both "MRP" and "Our Price" are indeed Food Bazaar's price. Are they trying to fool customers? In any case, outlets like Food Bazaar and Star Bazaar are coming up with their own in-house brands for almost every category now (especially food) and in some cases the packaging is so similar to the other popular product in the category to easily deceive someone to actually be the 'popular' brand. Now, on top of that, doesn't a display like this make the consumer feel that it actually is something which is otherwise expensive and on discount here? Nice tactic, but is it right, given that both prices are their own. They could have easily written 500 instead of that 75 also then. What do you think? Tasty treat is a private Label. The MRP is of the product and Our price is basically the store giving you discounts. Inspite it is future group brand. The Private label and store 'big Bazaar' cannot be compared.